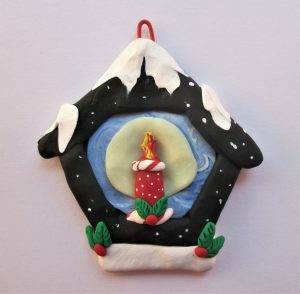 Today’s polymer clay ornament can be found at GardenArtandMoore. Garden Art and Moore is the Etsy shop of Dyane Lubanka Moore. 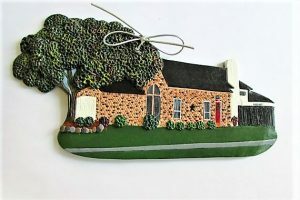 If you send her a photo of your home, she can recreate it in polymer clay. I could not find a website for her but I did find her facebook page. Her Facebook page has not been updated in some time but check out her Etsy shop. The house ornaments command a high price but they are well worth it when you see the care and detail that goes into each ornament. Take some time today to enjoy the work of artist Dyane Lubanka Moore at her Etsy shop, Garden Art and Moore. I will see you again on Wednesday with another polymer clay Christmas ornament!